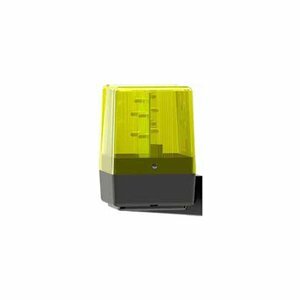 LED warning flashing light, 24V AC – 220 V AC. Electronic flashing lights, provided with 14 LED 5 mm, yellow light, high-brightness. Power supply: 220 V ac and 24 V ac / dc on the same circuit. Selectable fixed or flashing light on the circuit. Equipped with a bracket for wall mounting in vertical position. Cover color: yellow standard, on request orange or transparent.